So I’m to the left of most of the folks here, which gives me a different point of view on a lot of things. Today I read a story in Slate (which is liberalish but more contrarian than any other one thing) which triggered my memory of a piece from The Jacobin (which is honest-to-god leftist). I read them in the opposite order than I’m going to put them in for you. From Slate: America’s Brush With Fascism: The second KKK shared a disquieting kinship with European fascist movements. Why did it fail to take over American politics? From The Jacobin: Bernie Sanders Wants You to Fight: When Bernie Sanders says “It’s not about me, it’s about us,” he’s not just pandering. He’s trying to create a mass movement — because he knows that without one, his agenda doesn’t stand a chance. If this analysis has merit, then the irony is acute. That phenomenon deemed least American by the dominant culture from the founding of the republic forward—class struggle waged by the propertyless, many of them black Americans and recent immigrants—may have contributed more than we will ever know to keeping reactionary populist movements at bay in the United States during the Great Depression. Perhaps, after all, it was those with the least “stake in society” who had the most stake in defending democracy. 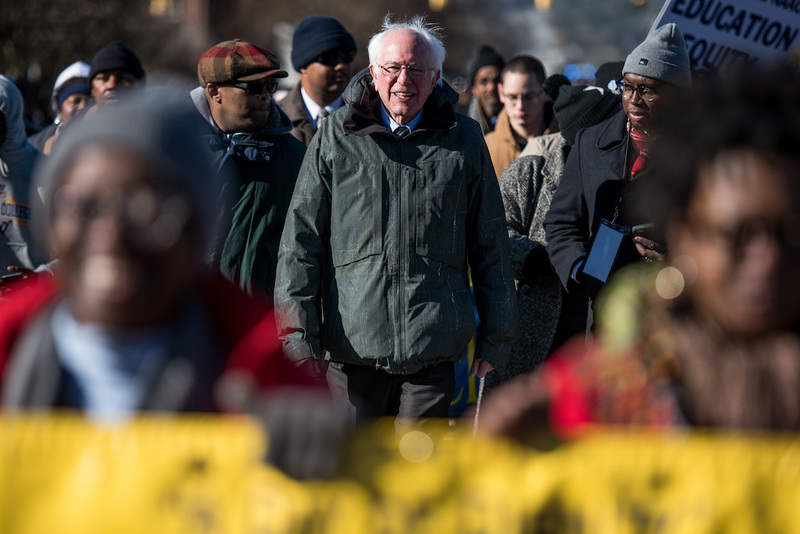 Because Bernie’s politics were forged in that era of mass protest, it comes as little surprise that he values extra-parliamentary politics on principle. But there’s a very good strategic reason for him to value grassroots left-wing and working-class movements as well. If he becomes president, he will need them to accomplish anything ambitious. …The socialist idea morphed in the late twentieth century from a powerful taboo to a tacit impossibility, unions were hollowed out and hamstrung, and the organized Left was placed on the back foot. Without a unified mass movement to represent, Bernie marched to the beat of his own drum for decades. But in that time, stagnating wages and rising living costs have tested millions of people’s patience with the status quo. The 2008 financial crisis, Occupy Wall Street, and Black Lives Matter further eroded popular tolerance for business as usual, creating new openings for left-wing politics. In a happy historical coincidence, Bernie Sanders happened to have stayed politically consistent, to be in good health, and to be personally willing to provide electoral leadership to a movement getting back on its feet. The second article explains why Bernie has to run even if he can’t win: Either way, he’s building the infrastructure for a movement. (Obama could have–he had a great start on it–but that’s really not who he is, and so he didn’t. That and his slowness to nominate judges in his first two years are terrible, consequential failures on his part.) The first article explains why that work is so important at this point in history: It’s a valuable defense against a rising tide of fascist and authoritarian thought. It’s one more “happy historical coincidence” Bernie’s doing that work at this time. If I had to pick one for another ten years of great health and the other to drop dead today, I’d keep him over the Notorious RBG. His work is more important.